Obama was elected at a time when political anxiety in America was relatively high, particularly among Democratic voters who disliked George W. Bush’s seeming lack of sophistication. The feeling was that the US had wasted trillions of dollars in Iraq and Afghanistan, and thus helped to ruin America’s economy and divert attention away from more serious adversaries like Russia and especially China. The economic failure was seen as being confirmed by the financial crisis, which began with the collapse of Lehman Brothers only a month or so before the election. The foreign policy failure was seen as being confirmed by, among other things, Russia’s invasion of Georgia three months before the election, followed one day later by the extravagant opening ceremony of the Beijing Olympics. Even during the presidential lame duck period leading up to Obama’s inauguration, a number of politically or symbolically negative global events occured, including the throwing of a shoe at Bush in Iraq, the 2008-2009 Israel-Hamas War in Gaza, and the Mumbai Attacks in India. Obama ran against Clinton in 2008 as an upstart candidate in the Democratic primary. He attacked her where she was least popular, which in foreign policy was her support for invading Iraq while in the Senate in 2002. The primary was a close one: Obama won 53 percent of the delegates but actually lost the popular vote as well as the largest state of California. As such, though it is always hard to untangle political strategy from principled belief, it does not seem so far-fetched to imagine that Obama’s campaign policy of Afghanistan being “the good war” and Iraq “the bad war” was, at least in part, devised in order to exploit Clinton’s Iraq weakness without making Obama appear to be too dovish or isolationist. We do know that Obama was not above abandoning his own principles for the sake of victory; he publicly opposed gay marriage until mid-2012, for example, when for intellectual and dispositional reasons it was obvious he was privately in support of it even at the time. Upon coming into office, Obama formed three main foreign policy positions. One was the “pivot to Asia”, which included both the re-prioritization of Afghanistan over Iraq as well as the rhetorical move to acknowledge the 21st century as ”America’s Pacific Century” (which became the title of a widely heralded article in Foreign Affairs written by Secretary of State Clinton). While both the withdrawal from Iraq and the public assumption of a rising Asia preceded Obama’s arrival in office, he was a natural fit to promote such policies given that he never supported the invasion of Iraq (as 42 percent of the Democratic politicians in Congress had done in 2002), and given that he had personal experience in the Pacific, having grown up in Hawaii and Indonesia and attended college in Los Angeles. While Obama’s pivot to Asia was mainly rhetorical — it had to be, since the American military never left Asia in the first place and so could not truly pivot back to a region it was already in — he and Clinton did begin healing American relations with a very important Asian country, Myanmar (aka Burma), a diplomatic feat similar to the one Obama would repeat in his second term with both Cuba and Iran. Another policy was the “Reset with Russia”, which, as with the later reset with Iran, centred around nuclear de-proliferation but was intended as a broader political reconciliation between countries. Obama was attacked heavily by Mitt Romney and Republicans in the 2012 election for having carried out this Reset, to which he and the Democrats successfully responded by ridiculing the Republicans for being “stuck in the Cold War”. This now appears tragically ironic, given how the 2016 election campaigns turned out. But Obama’s Reset with Russia was quite rational. America needed Russia in order to effectively carry out the surge of US troops into Afghanistan between 2010 and 2014. Russia retains, among other things, a substantial amount of political influence within countries like Tajikistan and Uzbekistan, which neighbour Afghanistan—and an estimated 30-40 percent of Afghanistan’s population is either ethno-linguistically Tajik or Uzbek. The US was also more concerned with containing China than it was with containing Russia at the time, since China’s economy had not yet appeared to slow down and since Russia had not yet formally annexed Crimea or involved itself forcefully in other areas of Ukraine or in Syria. Moreover, Obama’s Reset with Russia eventually contained a big caveat: the doubling-down of America’s growing military relationships with East European countries like Poland and Romania. Today, with US-Russian tensions having risen tremendously and with the European Union no longer seeming like a potentially potent force, these relationships seem crucial and continue to grow. At the time, they were meant to reassure countries like Poland that they were not being abandoned in the Reset, and at the same time to return the favour that some East European countries had provided when they sent lots of soldiers (relative to the size of their populations and economies, and relative to countries in continental Western Europe) to fight alongside the US in Iraq and Afghanistan. Among other things, this move included Obama planning missile defence system components in Poland, Romania, and Turkey. The Russians objected loudly to any missile defence program, since they did not want to see the US military presence in Eastern Europe grow. Obama responded that the Russians were being paranoid and that the defence systems were in fact intended only to block future Iranian missile capabilities. This was a ridiculous claim, given that most of the countries involved in the plan surrounded Russia. But the American media mostly ate it up, either because they did not bother to look at a map, or because most Republicans preferred to attack Obama as too weak on Russia rather than too strong on Russia, or because many Democrats did not want to question Obama in general. While the systems would not be able to block the Russian missile arsenal if it ever came to war, they were an important symbolic gesture and another step in the growing US military alliance with states like Poland. When Obama had earlier, in 2009, backed down on the missile defence issue — announcing, on the 70th anniversary of the Soviet Union’s invasion of Poland in 1939, the cancellation of missile defence in Poland and the Czech Republic, and later being caught on a hot mic in 2012 saying to Dmitry Medvedev that he would have more flexibility in missile defence planning once re-elected — Romney attacked Obama sharply for doing so. But Romney’s campaign was ridiculed for mistakingly using the name Czechoslovakia, taken as a another proof of his being trapped archaically in the Cold War. Romney was especially reproached, even by Republican Congressional leader John Boehner, for declaring Russia to be “America’s number one geopolitical foe”. (That Romney might now become Trump’s Secretary of State boggles the brain). And while Obama may have Reset with Russia early on, he has definitively broken with Putin since. The third major policy early in Obama’s first term was an attempt at reconciliation with the Muslim world, and particularly with the Arab world, intended to reverse the negative feelings that had grown there — and that Liberals in the West had perceived to have grown there — during the Bush years. Obama was the right man for this job, given his moderate and liberal personality as well as his personal experiences in Indonesia, his middle name Hussein, his grandfather’s conversion to (Shiite) Islam, and his family in Kenya, a partially Muslim country. Obama went to Turkey, Iraq, Saudi Arabia, and Egypt during parts of his first and second overseas trips as president, and gave one of his most famous speeches, A New Beginning, in Cairo, the largest city in the Arab world, at an event co-hosted by Cairo University and Al-Azhar University. Obama’s first-ever presidential television interview was with Al-Arabiya, a Saudi-owned, UAE-based news channel. This “apology tour”, as Obama-bashers call it, earned him the ire of Republicans for not having stopped in Israel while in the region (though he visited the site of the Buchenwald concentration camp the day after making the Cairo speech). It also helped racist or extreme right-wingers in their attempt to portray Obama as a hidden Muslim, quasi-Muslim or, in the case of those like the shameless, shameful Donald Trump, as possibly foreign-born and therefore not a legitimate president. (This was especially shameful given that the man Obama had beaten to become president, John McCain, was actually not born in an American state, but rather in Panama’s Canal Zone). Incidentally, Shiite Muslims have a centuries-long history of publicly pretending not to be Shiite for fear of being persecuted by the majority Sunnis; this, combined with Obama’s family background, has now led some in the Arab world to accuse Obama of being a secret Shiite with an agenda to allow Shiite Iran to emerge victorious over Saudi Arabia and its Sunni allies. Of course, Obama’s outreach to the Arab public was put to the test two years later in the Arab Spring, which also centred in Cairo. Predictably for an American president, Obama chose more or less to stand by America’s main allies in the Arab world — the Egyptian military and the royal families of the Arabian Peninsula. Obama only abandoned Hosni Mubarak (a former general) during the middle of the 18-day protest in Tahrir Square, earlier only suggesting that Mubarak not run for re-election following the end of the term he was serving as Egypt’s president at the time. In the years since, Obama has not pushed back much against Abdel Fattah el-Sisi, who threw out the elected Muslim Brotherhood government of Muhammad Morsi in a military coup and has since declared the Brotherhood to be an illegal terrorist group. (The Sisi government also had support from the political parties which got the second most votes in the post-Mubarak elections, namely the Saudi-backed religious Nour bloc). Similarly, Obama did not limit the Saudis from sending troops to break up Arab Spring protests in neighbouring Bahrain, a Shiite-majority state ruled by a Sunni monarchy. Maintaining the power of Bahrain’s royal family was a key issue for the Saudis, as Bahrain is connected by a causeway to Saudi Arabia’s remote, vast, sparsely populated, Shiite-majority Eastern Province, which is where most Saudi oil and gas is located. Given that his support for Arabian kings and Egyptian generals was in some ways arguably an abandonment of the “Arab Street”, which Obama had previously supported rhetorically and which the Western media was going gaga over during its coverage of the Arab Spring, Obama’s war in Libya showed that he was still not entirely pro-dictator in the Arab world. This is not to say that Obama waged the war for cynical political reasons, however. The case for the Libya war was fairly straightforward: Gaddafi was an aging tyrant who had ruled for four decades, his impending death or incapacitation due to old age would have risked a war anyway given the enormously divided nature of Libyan geo-politics, and any spillover from a war in Libya was unlikely to be too large given that Libya only has six million inhabitants and is surrounded by the Sahara. Thus, eventually, we arrive at the events of September 11, 2012, in Benghazi, Libya’s second largest city. Bengazhi is the largest city within a vast radius of itself, especially to the south; it was the city that was initially the centre of the anti-Gaddafi movement—the very city Obama had been aiming to protect from a massacre of Arab Spring protestors when he ordered the US military intervention in Libya. Of course, the Democrats are correct when they say that the Republicans shamelessly used Benghazi in order to try to tar the reputation of Hillary Clinton in order to win the White House in 2016. (If Trump boomerangs on the Republican Party at some point, they might finally get what they deserve for this). Republican cynicism notwithstanding, however, supporters of Obama have arguably misunderstood the Benghazi affair. It is now seen entirely, or almost entirely, as an anti-Clinton or anti-Obama stunt. To understand why this may be an incorrect view, it is important to recall how the war in Libya was interpreted between Gaddafi’s death in 2011 and the Benghazi attack ten and a half months later; a period that overlapped with most of the Obama-Romney presidential race and immediately followed Bin Laden’s death. The Libya war was, at the time, seen as an enormous success by both the centre-left and the centre-right (and the centre-centre). The centre-right liked the war because the centre-right is hawkish. The centre-left liked the war because it was portrayed as a counter-argument to the Bush-era invasion of Iraq they so despised: Libya did not become a quagmire involving US ground troops, it was fought by a coalition that included European and Middle Eastern countries which had refused to be involved militarily in Iraq, it did not involve misleading claims about weapons of mass destruction (Gaddafi had already given Libya’s WMD program up in 2003, following the US invasion of Iraq), and it was part of a broader anti-tyranny movement, the Arab Spring. With Bin Laden too having just been killed — another feat Bush failed to achieve — Obama seemed to be moving from strength to strength. As Biden put it in the campaign: “Bin Laden is dead and General Motors is alive”. As Clinton put it (regarding Gaddafi): we came, we saw, he died”. Wars almost always boost a president’s popularity in the short term. Given that the US economy was still reeling from the Great Recession and thus Americans ready to vote for change (which they did eventually, with Trump), and given that the Republicans had controlled Congress since 2010 and so were able to block most of Obama’s non-military initiatives, having Libya be seen as a quagmire-free foreign policy success was a boon for Obama. Though Obama went on to crush Romney in the electoral college, his victory was in fact not a large one: Ohio, Virginia, and especially Florida were extremely close, Obama received just 51 percent of the popular vote nationwide, and the Democratic Party did not succeed in winning back control of the Senate or the House. Not long after Gaddafi was killed, the media largely stopped paying attention to Libya. The Republicans began to pin more of their hopes on portraying the withdrawal of troops from Iraq as having been destabilizing and a sign of Democratic weakness. However the Benghazi attack, just 25 days before the election, risked showing the American public that Obama’s war in Libya — along with the various other conflicts in the Arab or Muslim world, including Iraq — was going to be somewhat messier than it had been portrayed as. This was an “October Surprise” that terrified the Democrats, since Obama was ahead in the polls. Obama and the Democrats, it appears (though it is difficult to be sure), tried to obscure the Libya issue by exploiting the fact that the media was at the time spending most of its attention obsessing over an offensive, low-quality movie posted on Youtube, called the Innocence of Muslims. The claim was that the video had outraged Muslims and thus spontaneously caused protests that in turn caused the Benghazi attack — a somewhat ludicrous claim, though plausible, and maybe even accurate, given that the attack was relatively sophisticated and, more importantly, that the attack was carried out on the anniversary of 9-11 and came in the wake of months of small attacks and attempted attacks on US and Western targets in Benghazi and in post-Gaddafi Libya in general. The Obama administration was later forced to walk this claim back — and Susan Rice was forced to give up her bid for Secretary of State because of the claim, at least ostensibly — because the Republicans would not let the issue drop. However that same Republican relentlessness arguably ended up backfiring, since most people saw that the Republicans were mainly concerned with exploiting a tragic event in order to tarnish Obama and Clinton. Moving on to Syria, and specifically to Obama’s “Red Line”: it is difficult to know whether or not the US should have intervened more forcefully in Syria, and it is also difficult to know how much truth there is to Obama’s claim that he extracted significant concessions from Assad as a result of bluffing during the Red Line affair. What we do know, though, is that in spite of the fact that most Republican supporters and even many Democrats claim that Obama was either weak for not following through on the bluff or stupid for bluffing in the first place, it is in fact not at all clear that bluffing in matters of war is stupid or that failing to follow through on a bluff in the event that it is called — even despite the risk of losing credibility as a result — is a weak thing to do. Thus while Syria remains an immense tragedy and Obama’s role in it is open to debate, the certainty with which many claim that Syria will be remembered as Obama’s top mistake appears to be unfounded. Finally, let’s talk about Obama’s position regarding Iran, which, in the long term, will possibly be considered his most significant legacy in foreign policy, the equivalent of Jimmy Carter’s reacquaintance with Anwar Sadat’s Egypt or even of Nixon’s reacquaintance with Maoist China. The Obama stance on Iran has often been misunderstood in at least one of the following three ways. One, that it is primarily about Iran’s nuclear weapons program. It is not (though this is of course not to say that nukes are not a very real issue). Two, that Obama and Netanyahu were at odds over America’s stance on Iran. They were not (though this is not to say that relations between Obama and Netanyahu have been hunky-dory or that Israel is not rightfully wary about the improving US-Iranian relationship and Iranian weaponry). Three, that Obama’s policy came from a place of dovishness. In fact, it came just as much from a place of hawkishness: Iran is in some respects a crucial potential US ally. The conflict between America and Iran began to heat up after the invasion of Afghanistan in 2001 and Iraq in 2003. This was because both invasions had created overlapping spheres of influence between US soldiers and Iranian proxies, and because both invasions had strengthened Iran’s regional influence. Iran had been enemies of both Saddam Hussein and the Taliban. Saddam’s regime had been led by part of Iraq’s Sunni Arab minority, whereas as most of the rest of Iraq are Shiites like the Iranians or else Sunni Kurds (and Kurds are ethno-linguistically closer to Persians than to Arabs). Iran had fought a war against Iraq in the 1980s in which hundreds of thousands of its citizens were killed; the Iranians are now been interfering in Iraq in order to ensure this never happens again. The Taliban in Afghanistan, meanwhile, are predominantly composed of Sunni Pashto-speakers, yet Afghanistan also has a sizeable minority of Shiite Muslims and is more than a quarter Tajik (and Tajik is mutually intelligible with Persian). Iran had threatened to go war with the Taliban in 1998, following the group’s killing of Iranian diplomats. Apart from Pakistan, Iran is the crucial Muslim neighbour of Afghanistan. Iran’s border with Afghanistan is half as long as the enormous US-Mexican border, and even harder to build a wall across. With Saddam’s Baathists and the Taliban out of power in cities like Baghdad and Kandahar, the Iranians were free to spread their political wings within the region, especially once the US left Iraq. To clip these wings, the US enforced sanctions on Iran and played good-cop bad-cop with the Israelis in threatening to carry out strikes against Iranian military and infrastructural targets. At one point, around 2010-2013, it was commonly expected that Israel and/or America would attack Iran imminently. This good-cop bad-cop role also served both Obama and Netanyahu quite well in their own respective domestic politics. It allowed Obama to avoid appearing to be a warmonger, and allowed Netanyahu to portray himself as firmly standing up to both the White House and the mullahs in Iran in an attempt to ensure security for the Israeli public at any cost. Indeed, Israeli-Iranian tensions were declining even before Netanyahu’s famous speeches in New York or, later, in Washington. Hamas’s relationship with Iran weakened as a result of Iran’s backing of Assad, which Hamas was not happy with (Hamas’ leadership moved out of Syria in 2012, to Qatar). Iran’s proxy Hezzbolah, meanwhile, became too distracted with helping to prop up Assad in Syria to focus on Israel as it had in its war with Israel in 2006. Moreover, around this same period Israel’s relationship with Turkey deteriorated sharply as a result of the Gaza Flotilla incident in May 2010, and later because Turkey was angered by the coup against Muhammad Morsi of Egypt’s Muslim Brotherhood, the organization from which the Hamas movement was originally sprung. The Iran-Hamas breach over Assad, Hezzbolah’s distraction, and Israel’s growing wariness of Turkey brought a thaw between Iran and Israel. But politics is politics; for now, both countries remain boogeymen in the eyes of one another’s medias. Many, similarly, believe Obama and Netanyahu to be hated rivals, or, at least, frenemies, when it is not at all clear that their opinions of one another are really so low as they are portrayed. Those who watch NBA basketball (as Obama does) would be familiar with the “hold me back” strategy Obama and Netanyahu arguably used against Iran in the years leading up to the signing of the US-Iranian deal on nuclear and sanctions reductions. The real breach between the US and Israel, if indeed there is to be one in the years ahead, is likelier to occur over issues like Palestine or even Pakistan (where the larger nuclear threat to Israel is located, arguably) than Iran, given Iran has a number of important shared interests with both Israel and the US. The Obama rapprochment with Iran occured as a result of the fact that Iranian influence was curtailed by the Arab Spring, with the Saudis quelling Shiite protests in the Persian Gulf state of Bahrain and, even more importantly, with large chunks of territory within Syria and Iraq being taken over by militant Sunni groups, including but not limited to ISIS and Al-Nusra. Iran is no longer in a potentially dominant position in the Middle East. As a result, Obama has in recent years has been able to have warming relations with Iran and work, in effect, alongside the Iranians in containing ISIS and in trying to have US troops withdraw from Afghanistan without sacrificing major cities to the Taliban. While the media now gives a lot of attention to how the US and Iran share an interest in blocking ISIS, the shared US and Iranian interests that exist within Afghanistan are generally overlooked. But the US desperately wants to avoid a situation akin to when the Soviets left Afghanistan in the late 1980s—which brought civil war, the mutilation of the Afghan Prime Minister, a spillover of violence into Pakistan and between Pakistan and India, and eventually Al Qaeda’s attack on the US on 9-11. The Republicans, who continue to try to make Obama’s deal with Iran appear to be Munich-style appeasement rather than typical presidential diplomacy, do not usually point any of this out. Instead they focus on the Iranian regime’s tyranny and religiosity. Bringing up the extremism of Iran’s government should not be an irrelevant point, of course, but still it comes across as a rather weak excuse to fault the deal, given America’s closer alliance with countries like Saudi Arabia; an alliance the Republicans have played a part in. Their response that Iran, unlike Saudi Arabia, should be resisted mainly because it has the potential to become a regional power, ignores not only the fact that Iran’s position has been set back by the ongoing war in Syria, but also the fact that the US wants Iran to help it contain more plausible regional powers, namely Turkey or Russia. The US-Russian relationship has, of course, suffered seriously in recent years as a result of the conflicts in Ukraine and Syria, as well as because of the the meddling of Russia in the recent American election (assuming that either Putin or supporters of Putin were indeed behind the hacking of the DNC’s emails, as appears highly plausible). The Iranians are useful to the US in parrying Russian influence in both Central Asia and the Caucasus, in spite of the fact that Iran, Russia, and even the United States have in effect been working on the same side of the Syrian civil war at times. Iran has significant ties to a number of countries that used to be part of the Soviet Union, most notably Azerbaijan, Turkmenistan, and Tajikistan. Given that large Muslim populations in the Caucasus border large Muslim populations living within Russia, and given that Putin himself presided over the Second Chechen War, Iran’s position if of significance here. Reviving the stagnant energy industries in Iran and in Iran’s Shiite-majority ally Iraq also helps reduce the price of oil and, in the long-run, of natural gas, both of which Russia depends highly upon. Turkey, meanwhile, is a country that has a far larger economy than Iran, an economy that is not at all based on oil exports and is therefore much less exposed to the recent crash in oil prices than Iran’s is. Turkey is also, unlike Iran, a country that is dominated by a single ethno-linguistic group, “the Turks”, who by comparison to Iranians inhabit a fairly compact, non-mountainous region. Partly as a result of this, Turkey is not home to numerous separatist or regionalist movements like Iran is (the PKK, in Turkey’s eastern, mountain regions, being the major exception). An estimated 75 percent of people in Turkey are “Turkish”, whereas an estimated 60 percent of people in Iran are “Persian”. Iran is also a Shiite country, setting it apart from the large Sunni majority in the Middle East and in the Muslim world in general. In recent years, a number of areas that were once part of the Ottoman Empire have been hit hard by crises; notably Syria, Iraq, Libya, Greece, Ukraine, Cyprus, and Georgia. Turkish politics, led by Erdogan, have also become more Islamic than at any time since the empire fell in WW1. Recently, with Erdogan’s accusation that the Turkish cleric Gulen was behind the failed 2016 coup, and his demand the US extradite Gulen, Turkey’s Islamic politics may be becoming more unified and anti-American. US-Turkish ties have also become strained over America’s close ties to the Kurds in Syria and especially in Iraq. While relations between Turkey and America are still decent in spite of this, in part because the US wants Turkey to help block both Russia and Iran as well as re-establish a semblance of order within Syria and Iraq (where Turkey has troops), the writing is clearly on the wall: Turkey is more likely to be a major regional power than Iran is. Obama’s attempt at a political reengagement with Iran most likely reflected an understanding of this fact, given that Obama is a keen and “realist” policymaker, as most recent US presidents have been. Ultimately, it is often said presidents are most important in their symbolism rather than in any specific deals they manage to hammer out. If that is correct, Obama appears to score quite well on the short roll of post-Cold War presidents. Obama has been more articulate and likely more sophisticated than George W Bush was, and also more scandal-free and likely more genuine than Bill Clinton was. Obama’s critics too tend to claim that Obama’s most notable decisions in foreign policy were of the symbolic sort, whether it be his refusal to use the term Islamic terrorism, attend funerals in solidarity with the Charlie Hedbo and kosher supermarket victims in France (two weeks before attending King Abdullah’s in Saudi Arabia), or decline the Nobel Peace Prize awarded to him by starstruck Norwegians in the first year of his first term. Even those that do believe the worst of Obama, however — and there really is little reason to do so — should acknowledge he has done less harm to America’s reputation in eight years than Trump now has in the past eight months. Oil prices have fallen again: they are now at $29 a barrel for West Texas Intermediate crude and a similar price for Brent, their lowest since 2003. Natural gas, coal, and other commodity prices have also been dropping of late, in most cases. So: what will be the geopolitical consequences of cheap energy in general and of cheap oil in particular, all other things being theoretically held equal? One consequence of cheap energy is the weakening, possibly, of four potential great powers: Russia, Brazil, China, and Mexico. While the media has understood the Russian and Brazilian half of this list – their economies are both estimated to have shrunk by 1-3 percent druring 2015, after all, which is difficult to miss – it has largely failed to register the Chinese and Mexican half. This is because it views China as being a leading oil, energy, and natural resource importer rather than as a resource exporter like Russia or Brazil, and because it views Mexico as merely a source of drugs, migrants, resorts, and cheap goods rather than as a potential great power. China, furthermore, tends to import energy from the most commercially uncompetitive, politically fragile, or American-hated oil-exporting states, such as Venezuela, Iran, Russia, Iraq, Angola, and other African states like Congo and South Sudan. In contrast, Japan and South Korea get their crude from places that will, perhaps, be better at weathering today’s low prices, namely from Kuwait, Qatar, the UAE, and Saudi Arabia. Similarly, China gets much of its natural gas from Turkmenistan, Uzbekistan, and Myanmar, whereas Japan imports gas from Australia and Qatar and South Korea imports gas from Qatar and Indonesia. China’s top source for imports of high-grade anthracite coal, and its third largest source for imports of coal in general, is North Korea. China has, in addition, invested capital all over the world in areas hurt by falling energy and other commodity prices, including in South America, Africa, Central Asia, Canada, and the South Pacific. Another mistake the media makes is looking at China as if it were a country, rather than what it really is: both a country and a continent. Continents have internal, deeply-rooted regional divisions, and China is no exception. Its main divide is between areas south of the Yangtze River, which tend to be mountainous, sub-tropical, and dependent upon importing fossil fuels, and areas north of the Yangtze, which tend to be flat, more temperate, and rich in fossil fuels. Northern China, stretching over 1000 km from Beijing southward to Shanghai on the Yangtze, is the country’s political heartland. It is densely populated and home to most of China’s natively Mandarin-speaking, ethnically-Han citizens. When compared to southern China, the north has historically been somewhat insulated from foreigners like the Europeans, Americans, and even Japanese. Beijing’s nearest port is roughly 5000 km away from Singapore and the Strait of Malacca; Hong Kong, in contrast, is only around 2500 km from Singapore and Malacca. Beijing is rougly 2600 km from Tokyo by ship, whereas Shanghai is just 1900 km from Tokyo and Taipei is just 2100 km from Tokyo. Japan’s Ryukyu island chain and the Kuroshio ocean currents historically allowed for easy transport from Japan to Taiwan and the rest of China’s southeastern coast; the Japanese controlled Taiwan for more than three and a half decades before they first ventured into other areas of China in a serious way during the 1930s. Even today, Japan accounts for a larger share of Taiwan’s imports of goods than do either China or the United States. Southern China has often depended on foreign trade, since much of its population lives in areas that are sandwiched narrowly between Pacific harbours on one side and coastal subtropical mountain ranges on the other. In northern and central China, in contrast, most people live in interior areas rather than directly the along the Pacific coast. These people in the interior generally did not engage in as much foreign trade, as in the past moving goods between the interior and coast was often limited by the fact that northern China’s chief river, the Huang-he, was generally unnavigable and prone to flooding northern China’s flat river plains, destroying or damaging roads and bridges in the process. In southern and central China, by comparison, even people living far inland could engage with the coast by way of the commercially navigable Yangtze and Pearl Rivers, which meet the Pacific at the points where Shanghai and Hong Kong are located. Northern China, however, was most directly exposed to the land-based Mongol and Manchu invaders who ruled over the Chinese for most of the past half-millenium or so prior to the overthrow of the Manchu Qing Emperor in 1912. Today the north continues to retain the political capital, Beijing, and a disproportionally large majority of Chinese leaders were born in north China — including Beijing-born Xi Jinping and Shandong-born Wang Qishan (a former mayor of Beijing) — in spite of the fact that most Chinese political revolutionaries, including Mao Zedong, Deng Xiaoping, Chang Kai-Shek, Sun Yat Sen, Zhu De, Ye Jianying, Hong Xiuquan, and famed writer Lu Xun, hailed from southern or south-central China. Today, out of China’s seven Standing Comittee top leaders, only seventh-ranked Zhang Gaoli was born in southern China, whereas five of the seven were born in northern China and one, Premier Li Keqiang, was born in central China. Zhang Gaoli may in fact be the first person born outside of northern or central China in thirty years to have made it to the Standing Committee. He is also the only person currently in the 25-member Politburo born outside of northern or central China. Among the 11-man Central Military Commission, meanwhile, seven were born in northern China, while two were born in north-central China and two in south-central China. Out of the 205 active members of the Party Central Committee, fewer than 15 were born south of central China. Indeed, the southern half of China, stetching from islands in Taiwan, Hainan, Hong Kong, Xiamen, and Macau in the east to the plateaus of Yunnan, Sichuan, and Tibet in the west, is politically peripheral. It is home to a majority of China’s 120 million or so non-Han citizens (most of whom are not Tibetan or Uyghur, though those two groups recieve almost all of the West’s attention), China’s 200-400 million speakers of languages other than Mandarin, China’s tens of millions of speakers of dialects of Mandarin that are relatively dissimilar to the Beijing-based standardized version of Mandarin, most of China’s 50-100 million recent adopters of Christianity, and most of China’s millions of family members of the enormous worldwide Chinese diaspora. 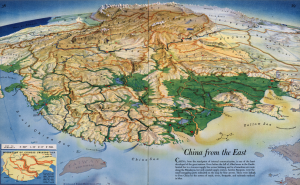 Southern China is physically closer to Southeast Asia (a region with a huge Chinese minority population) and most of the populous areas of Japan, and further away from sparsely populated Mongolia or Siberia, than northern China is. The south’s Fujian province, in particular, is linguistically and economically close to Taiwan, while the south’s Guangdong province is close to Hong Kong. A large share of China’s GDP comes from the coastal areas of China from around Shanghai south to Guangdong, particularly if you include Taiwan as part of the country. Guangdong alone accounts for an estimated 10% of mainland China’s GDP and over 25% of its exports. This creates a somewhat unbalanced dynamic: China’s political periphery is also its economic centre. As it happens, northern China produces almost all of China’s fossil fuels (particulary in and around Shanxi province, 300 km or so inland from Beijing, where a large share of China’s coal is mined and which has seen the biggest political shakeup of any province from Xi Jinping’s anti-corruption campaign thus far), whereas southern and central China, especially if you include the neighbouring economy of Taiwan as being part of China, account for most of China’s imports of energy. Taiwan, in fact, may be more dependent on oil imports than any other significant economy in the world. Falling energy prices may weaken the Chinese political heartland relative to its periphery, in that case. Whether or not this will generate any political instability going forward remains to be seen. China is not certain to increase its energy imports nearly as much as less-developed economies like India, meanwhile, as the Chinese inudstrial sector is facing challenges as a result of its past generation of energy-intensive growth. China faces rising labour costs in its cities, a pollution problem, crowded transportation infrastructure, a US that is concerned with Chinese industrial power, and countries throughout the world afraid of China’s world-leading carbon emissions. In addition, China is located much further away from the Persian Gulf and Caspian Sea oil and gas fields than the Indians and other South Asians are, and so might have difficulty accessing them in a pinch. China may also have to face industrial competition from resource-rich or capital-rich economies such as Australia, Norway, Canada, Qatar, Texas, and maybe even Hong Kong, which will perhaps be able to use energy-intensive robots of various kinds to build up their manufacturing sectors in spite of their small labour forces. This could make China’s industrial growth rate slip, which in turn might reduce China’s resource imports and thus prevent China from becoming the leading beneficiary of low energy and commodity prices. Such a shift will be especially likely if the United States or European economies decide to enact tariffs on goods coming from places that generate power by using coal in inefficient ways, a prospect that has become increasingly likely as a result of America’s triple-alliance between environmentalists opposed to coal consumption, shale gas producers competing with coal, and energy companies trying to pioneer more expensive but cleaner ways of consuming coal. China may then have to focus on growing its service sectors instead of its energy-intensive industrial sectors. Japan, lastly, might benefit from Russia’s energy-related woes more than China will. This is not only because the Chinese have to a certain extent often looked to Russia as an ally against the West, but also because the areas of Russia that China is close to are mostly irrelevant to China: they are landlocked, Siberian, and for the most part located far from China’s population centres. Pacific Russia, in contrast, located next to the Sea of Japan on the East Asian side of Russia’s Pacific mountain ranges, has a far more liveable climate than the continental Siberian interior, is home to a number of useful medium-sized port cities, and accounts for much of the oil and nearly all of the Russian natural gas exports to Asia — led by energy-rich Sakhalin Island, which is just 40 km away from Japan and was partly owned and inhabited by the Japanese prior to the Second World War. Russia may, in fact, be somewhat better prepared to fight another border war with China like it did in 1969, which might not be too different than the many other wars Russia has fought around its own borders both prior to and since then, than it would be to face off against Japan again within its far-eastern, mountainous, archipelagic and peninsular Pacific region, as it did in 1905 and then during World War Two. Of course this does not mean Japan will attack Russia — though it has certainly toyed with the idea of making more forceful moves in the Southern Kuril Islands, which both countries claim as their own. Even the unspoken possibility of conflict, however, may help grant the Japanese leverage over Russia in negotiations relating to commercial or political issues. Mexico is much more than just America’s messy basement. It has the world’s 11th largest population,14th largest GDP, and, because it is in the New World, its population is in many ways much more internally unified than those of most other large countries are. It also has important ties to the rest of the Spanish-speaking world, to the Latin-based world in general, and to the 35 million or so Mexicans in the United States in particular, most of whom live in states adjacent to the Mexican border. Mexico is the clear potential leader in the Spanish-speaking world: its population is bigger than those of Colombia, Argentina, and Venezuela combined, and its economy is about to surpass Spain’s. If you include illegal transactions, Mexico already has the largest economy in the Spanish world by far. Along with (or perhaps instead of) Portuguese-speaking Brazil, Mexico could potentially help Latin America to become one of the most prominent regions in the world during the decades ahead. Mexico may not be a major beneficiary of low energy prices, for three general reasons. First, it is a net oil-exporting economy: oil exports accounted for an estimated 2.7% of Mexico’s GDP in 2014, and Mexico had been hoping to increase its oil and gas production since its president enacted widely-touted reforms in the country’s energy sector that year. Mexico is also often a relatively high-cost oil producer, and so may be forced to cede market share to more price-competitive producers in other countries. Second, Mexico has ties – both existing ties and potential future ties – to other countries in Latin America, a region that is highly economically dependent on exports of energy and other natural resources. Most of the South American economy is already in or flirting closely with recession as a result of the commodity crash, which on the whole is probably not a good thing for Mexico. Third, Mexico has ties to the southwestern United States, in the areas of America that were part of Mexico prior to the 1830s-1850s, most notably California and Texas where around 25 million Hispanic-Americans live today. Like Mexico itself, this part of the US is dependent on energy exports, led by Texas (a major producer of oil, gas, coal, wind power, solar power, and refined petroleum products: Texas produces approximately one-fifth of US energy and one-third of US crude oil) but also including the surrounding energy-producing states of Oklahoma, Colorado, New Mexico, Utah, Louisiana, Arkansas and the federally-administered oil-and-gas producing waters in the Gulf of Mexico. Nearly all of the states with a high share of Mexican-Americans are either energy-exporting states or else, in the case of California, New York, Florida, and Arizona, have the lowest per capita energy consumption of any states apart from tiny Rhode Island, Hawaii, and Connecticut. Even California’s energy imports do not balance out Texas’s energy exports, because California is itself the US’s third largest oil-producing state, tenth largest energy-producing state, and has the fourth lowest per capita energy consumption; its energy imports are not as large as one might expect given the enormous size of the Californian economy. They might even shrink in the future, if the Monterrey basin shale resources are developed. California is also the largest agricultural producer in the United States (Texas is fourth), a big sector that can be hit by falling commodity prices as well. Mexico has admittedly been benefiting from cheap gas prices brought on by Texas’s shale boom. Mexican imports of US gas have nearly tripled since 2009, which has benefited the industrial sector in northern and north-central Mexico. This gas import growth might slow going forward, however, as America’s LNG export facilities may soon be coming online, LNG import facilities in both Europe and China are expected to be opened soon, and the Panama Canal expansion which will be finised this year may allow LNG ships to traverse the canal from Texas to Asia for the first time. As LNG allows US gas to be sold worldwide, Mexico’s import growth of US gas might slow down. In any event, Mexico is the 19th largest natural gas producer in the world, so even with increasing imports from the US it will not soon become a significant net importer of natural gas. In the future, meanwhile, somewhat similar to China, Mexico’s industrial growth may not be as strong as most people expect, which could cause it to become less dependent on energy and other commodity imports relative to other countries. Mexico is currently a major industrial economy, the result of its large and cheap labour force and proximity to US consumers. As labour and other prices in northern and to a lesser extent central Mexico are becoming more expensive due to economic growth in these areas, however, Mexico’s industrial growth rate may slow. This is because central and especially southern Mexico are separated from the US by vast areas of mountainous deserts or jungles, making the north-south roads and pipelines through Mexico expensive to build, use, and maintain, as well as potentially vulnerable to groups like the drug cartels, indigenous peoples, or local governments. Southern Mexico resembles Central America more than it resembles northern Mexico. Mexico may increasingly also have to face industrial competition from Cuba, which is the only other sizeable Hispanic country close to the United States; from Venezuela, if it too can finally mend fences with America and leverage its energy resources to industrialize; or from Canada and the US, if they try to use robots and other technologies to re-industrialize. If, finally, domestic politics lead the US to try to make the Mexican border more of a barrier, Mexico might have to industrialize less and stick more to the many other sectors of the diverse Mexican economy, which are less resource-intensive. There is a fourfold division in Europe, where energy and commodity imports are concerned. First is between mainland Europe, which is a major importer of energy and oil, and the regions surrounding mainland Europe (namely Scandinavia, the North Sea, the former Soviet Union, the Middle East, North Africa, western Africa, and the Americas), which are energy and commodity producers. Even the United States has now become such a big energy producer that its energy imports account for only around 15% of its overall energy consumption, a very low share in comparison to an estimated 62% in Germany, 71% in Spain, 77% in Italy, 46% in France, and 43% in Britain. Second is between countries which use the Euro as their currency – Germany, Spain, France, Italy, Greece, Slovakia, etc. – which tend to be significant importers of oil or other commodites, and countries that do not use the Euro – Norway, Sweden, Switzerland, Britain, Denmark, Poland, Romania, Czech Republic, Ukraine, Belarus, Russia, etc. – which tend to produce a decent amount of oil, energy, or other commodities — or else, like Switzerland, have economies that are not energy-intensive and so may not benefit as much from cheap energy. (Switzerland, the 20th largest economy in the world, also relies on imports for just 52% of its energy, according to the World Bank, which is a lower share than in all but four of the 19 countries within the Eurozone). Admitedly there are a few exceptions to this rule: most notably Turkey, which imports a lot of energy but does not use the Euro, and Estonia and to a lesser extent the Netherlands, which produce a decent amount of energy domestically yet do use the Euro. Still, even the Netherlands is a major net importer of crude oil. The third division is between countries that are in the European Union and European countries that are not in the European Union. This division is similar to the Eurozone one, except that states like Britain, Denmark, Poland, Romania, and Sweden — all of which are mid-sized energy or commodity producers – are in the European Union but do not use the Euro, which leave the continent’s major commodity and enegy producers of Norway, Russia, and Ukraine as more prominent outsiders. Turkey, meanwhile, is, unlike Russia, Switzerland, Norway, or Ukraine, a member of the quite important European Customs Union, though like them it is not part of the EU. Finally, and in some ways most pertinently, there is a division between northern Europe and southern Europe. The further north you go, the less dependent the Europeans are on energy imports. Scandinavia and Russia are the furthest north: they are major energy and commodity producers. (Even the three Baltic states, which are generally assumed to be among the smaller countries in Europe, actually own far more land per capita – and especially forested land, which is crucial for feeding Europe’s sizeable wood-fuel industry – than any European countries to the south of them do). These are followed by countries like Britain, the Netherlands, Romania, Ireland, the German economies, Poland, the Czech Republic, Slovakia, Hungary, Belgium, and northern France, which have economies that are also not too dependent on energy imports. (Like Switzerland, both Ireland and northern France have economies that are not at all energy-intensive, when compared to others). In southern Europe, finally, there are the economies of Spain, Portugal, Greece, Italy, France-sans-Paris, Turkey, Cyprus, and Malta, which are highly dependent on imports of oil, natural gas, and energy in general. (While nearby Algeria remains a large energy-exporting state and Libya has energy-export potential, Morocco, Israel, Lebanon, and Jordan are highly dependent on energy imports and Egypt and Tunisia are both more or less energy neutral). Perhaps not incidentally, most of southern Europe has experienced an economic depression during the past eight years. The biggest exception within southern Europe, meanwhile, is Italy, which produces more oil than France, Greece, Turkey, and Spain combined, slightly more oil than even Germany produces. This may in fact partly help to explain why Italy has been suffering a great deal of late, whereas the Spanish, Portuguese, and possibly even Greek economies might finally be on the mend. Even Italy is the world’s third largest gas importer, however, so as with Spain, Portugal, Turkey, and Greece, the Italians depend on imports from abroad to supply more than 70% of the energy they consume. Turkey is in the most interesting position of all when it comes to energy and geopolitics. It, along with its nearest European neighbour Greece, is a significant net energy importer; Turkey has a relatively energy-intensive economy and energy imports account for three-quarters of its energy consumption, while in Greece energy imports account for 60% of energy consumption. Oil imports in Turkey and Greece were estimated to be equal in value to 3.2% and 4.5% percent of GDP in 2014, respectively, both figures quite a bit higher than in most other countries within Europe. Surrounding Turkey and Greece, however, is a ring of leading energy-producing regions: the Middle East, Russia, Ukraine, the Caspian Sea-Central Asia region, and North Africa. Even Turkey’s closest Western neighbours of note, namely Italy, Romania, and Austria, are not necessarily going to benefit much from cheap oil or cheap energy. Italy produces nearly three times as much oil as Turkey does, Romania produces nearly twice as much oil as Turkey and depends on energy imports for just 22% of its energy consumption, and Austria has the lowest oil-imports-as-a-percent-of-GDP of any country in the Eurozone. Even Israel, Cyprus, and Egypt have made major new energy discoveries of late, of natural gas within the Eastern Mediterranean. In past years, Turkey has already seen many of its neighbours fall to shambles to one extent or another — first the Soviet Union, Yugoslavia, Lebanon, Algeria, and the Caucuses in the 1990s, now Iraq, Syria, Ukraine, Greece, Georgia, and Libya, among others. Further troubles in the regions surrounding Turkey, then, perhaps brought on by the falling price of energy, could create a serious power vaccum for the Turks to consider filling. Turkey’s close-to-home rivals the Kurds, meanwhile, are also potential losers in a cheap energy environment. They produce a lot of oil in Iraqi Kurdistan, abut a number of hydropower facilities located within Turkey’s mountainous Kurdish regions where the headwaters of the Tigris and Euphrates rivers form, and possess ties in some cases to energy-rich Iran (as a result of the Kurdish population in Iran as well as the fact that Persians tend to be ethno-linguistically closer to most Kurdish groups than most Kurds are to either Turks or Arabs) or to energy-rich Iraq (as a result of the sizeable Kurdish population that lives in Iraq). India, like China, is both a major energy producer, the seventh largest in the world, and a major energy consumer, the third largest in the world. In India, however, oil imports were equal to 5.3% of GDP in 2014, compared to just 2.4% in China, while energy imports accounted for 33% of Indian energy consumption, compared to just 15% for China. And whereas in China the areas that benefit the most from cheap energy are located outside of the Chinese political heartland, in India the country’s political core territories — which are centred around India’s largest state by far, namely Uttar Pradesh (population 200 million), as well as parts of its neighbouring states like Bihar (India’s third largest state), Madhya Pradesh (5th largest), Rajasthan (7th largest), and Delhi (India’s capital city, population 17 million) — may benefit among the most in India from falling oil and energy prices. 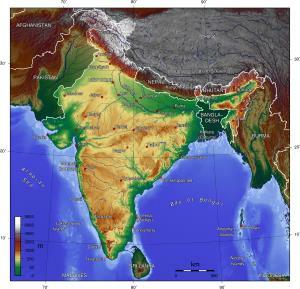 Some of the other areas within India, on the other hand, such as parts of both Western India (which produces 75% of the oil from onshore fields in India, and which has close economic ties to the nearby energy-rich Persian Gulf) and Eastern India (which is where most of India’s coal and other commodities are produced or exported), might not benefit in the same way*. [*when I say “benefit”, I mean it in the geopolitical sense of the term, not in the ethical sense. From an ethical point view, for example, the fall in energy and commodity prices is arguably great news for many of the people in Eastern India who were being exploited because of their coal and mineral wealth. Obviously, things like this are usually far more complicated in reality than can be captured in any single essay]. India’s geopolitical dream is of a prosperous, peaceful Indian Ocean basin in which it, by virtue of its size, diversity, and central location, would be far and away the most prominent and powerful country. In order to accomplish this India must have better relations with Pakistan, a country that has been backed by the United States as well as by fellow Muslim states like Saudi Arabia. With the Saudis and other Sunni Muslim countries hurt by cheap oil and energy prices, and with India’s traditional allies against Pakistan, namely the Russians and Iranians, hurt by cheap energy too, both India and Pakistan might perhaps be forced to rely more heavily on the Americans. If, then, the Americans decide to prioritize India-Pakistan peace-making as a way to maintain stability in South Asia and help to contain forces like China, Russia, and pan-Islamism, there may be some cause to be hopeful. Don’t be too sure though: there are plenty of reasons why India, Pakistan, and the United States might each find it difficult to pursue Indian-Pakistani or Hindu-Muslim reconciliation. Within the wider Indian Ocean region, stretching 6000 km from Madagascar to Indonesia and 6000 km from Sri Lanka to Kerguelen, there is also some scope for careful optimism. In East Africa, from around Ethiopia south through the Great Lakes, most economies are not dependent on energy exports in the way that western African countries like Angola, Nigeria, Algeria, Congo, Gabon, and Equatorial Guinea are. Even South Africa, the world’s sixth largest coal exporter, is not nearly as dependent on energy exports as Nigeria, Angola, or Algeria are, and is a net importer of crude oil. Oman and Yemen, similarly, the two Arab countries with coastlines directly along the Indian Ocean, are not nearly as dependent on energy exports as other Arab countries like Saudi Arabia, the UAE, Qatar, and Kuwait are. They, especially Yemen, may also be leading importers of food. In the eastern Indian Ocean, the Indonesian islands of Sumatra and especially Java (combined population: 195 million) tend to be energy-importing areas, in contrast to Indonesia’s Pacific islands like Kalimantan and, 3500 km to the east of the Indian Ocean, West Papua, which account for most of Indonesia’s energy production as Sumatra’s aging oil fields are declining. In Indonesia’s neighbour Malaysia, similarly, most oil production comes from around the Pacific island of Borneo, an island Malaysia shares with Indonesia and Brunei, rather than from the Malay Peninsula on the edge of the Indian Ocean where most of Malaysia’s population lives. Singapore, moreover, which is located roughly in between western Malaysia and western Indonesia, is the world’s 13th or 14th largest oil importer (it is roughly tied with Thailand, which is also located along the outer edge of the Indian Ocean); in spite of its small size Singapore now imports nearly twice as much crude oil as Indonesia and Malaysia combined export to the world.